One of the absolute joys of being an editor is working with creative individuals, especially those who share my passions. 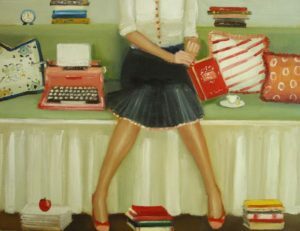 Two interests at the top of my list are books and art. Since becoming an editor, I have dreamt of the day when I could apply my editing skills to these two loves. I was determined that should such an opportunity arise, I would leap at the chance. 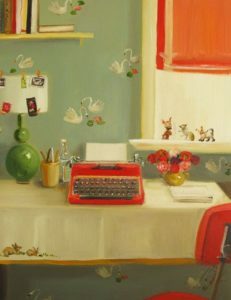 I first discovered the charming, whimsical art of Canadian painter and writer Janet Hill on Etsy. I was immediately drawn to this talented artist’s colorful, imaginative paintings. Through lushly detailed scenes and intriguing titles, the paintings conjured up stories tinged with nostalgia and mystery. Given her ability to create stories through her art, it was a natural progression for Ms. Hill to blend writing with her artwork. The result was her first children’s book, Miss Moon: Wise Words from a Dog Governess, an enchanting story about a governess dispatched to an island off the French coast to tame an assortment of sixty-seven wild dogs. Clearly, Ms. Hill was speaking directly to me! This was the chance I’d been waiting for. I immediately contacted Ms. Hill to tell her how much I loved her artwork and to offer my editorial skills for the book she was creating. I was thrilled when she agreed to my editing Lucy Crisp on a chapter-by-chapter basis. It was a delight to collaborate with Ms. Hill, to play a small role in her creative process. It also presented me with some new editing challenges. This was the first time I had edited an illustrated book. Not only did I need to carefully review the book’s text, I needed to apply a similar scrutiny to the painted images. I needed to ensure that each painting matched the text and that any edits I made to the text were consistent with the visual story Ms. Hill was telling. I also needed to make sure that there was an internal consistency between all of the book’s images. If Lucy was wearing a certain red dress on page one, she should be wearing the same dress two pages later, assuming it was still the same scene. The only downside to working with Ms. Hill was that her publisher, Tundra Books, liked her work so much that it decided to handle the editing of her book in-house. While I was disappointed that I wasn’t able to finish editing her book, I was pleased as punch that her distinctive and playful style was being embraced by her publisher, children, and readers like me, who are drawn to the magical worlds Ms. Hill so skillfully creates. Janet Hill’s next book features Miss Mink, the counterpart to Miss Moon, and will be published in September 2018. Lucy Crisp and the Vanishing House is slated for publication in September 2019. You can follow her at her website and on Etsy. Casey, hi! I’m wondering how many chapters you got to edit, if any, before the publisher took over. I was fortunate enough to be able to edit four chapters. Lovely story, Casey. I enjoyed the serendipity of her mentioning the need for an editor and your hearing the call.